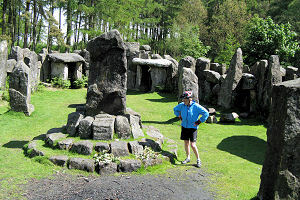 After various plans for a National Rally this year (summer 2009) fell through, we finally settled on a venue at Woodhouse Farm near Winksley, west of Ripon in North Yorkshire. 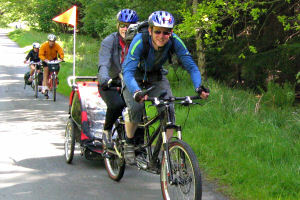 The event was run on very much a 'do it yourself' basis with those attending taking the initiative on activities. 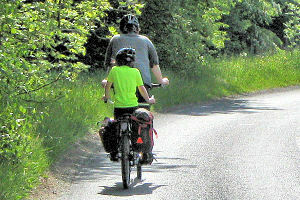 Each day two route options were offered where the long route was an extension of the short route so that the beginning and ending of all routes was common. It turned out to be a very enjoyable week, no doubt greatly helped by the extraordinarily sunny and warm weather. Most campers arrived and spread themselves out around the edges of the allocated area on this very pleasant campsite. A "casual" Welcome Evening was held with wine, beer, cheese and lots of chat. 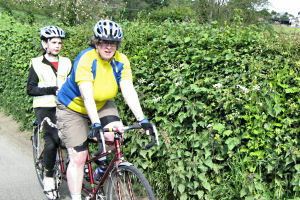 It was a beautiful blue, sunny and warm day to start tackling the many hills. 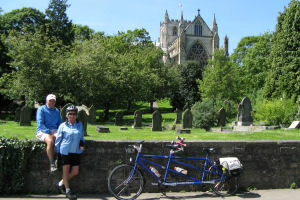 The "long" route of 32 miles took us north via lots of ups and downs and Kirkby Malzeard to West Tanfield: the route then went east and south into the flatter very pleasant lanes to bring us to Ripon and the impressive Ripon Cathedral. A rather difficult uphill bridleway out of Ripon took us south west and back into the hills to visit the huge remains of Fountains Abbey and the Mill and also the lovely Water Gardens of Studley Royal. This was another sunny day but later became cloudy with a rain shower in the late afternoon. 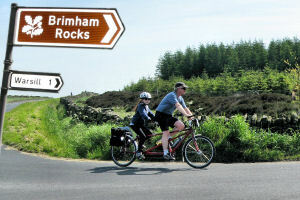 We climbed up yet more hills - this time to the south west with a very long drag up to the turning for the ancient Brimham Rocks. This area is owned by the National Trust and we were told we had to walk our tandems up a long track before being able to refresh ourselves from the kiosk with coffee and some excellent pasties and ice cream. 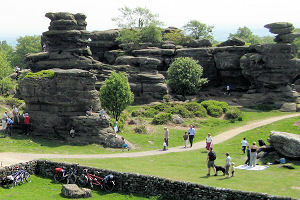 We enjoyed our refreshments on a suitably flat rock in the sunshine before spending a very pleasant time wandering around the strangely shaped and stacked rocks. A lovely south easterly downhill road took us to just outside Ripley where a good bridleway brought us along the south east side of Ripley Castle wall - it looked very busy inside with a falconry flying display and also a custom car show taking place. We opted for tea and cakes in the peaceful adjacent church to sustain us for the hills yet to come to return us to the campsite after a rather strenuous 24 miles. Sunshine and a strong west wind and of course lots of hills, found us making our way north west over the high and exposed moors to the Druid's Temple folly overlooking Leighton Reservoir: a strange place constructed by a rich lord (William Danby (1752 - 1833)) to relieve local unemployment at the time. We had just a couple more short uphills before turning east and being able to enjoy a good downhill whizz into Masham and refreshment at the excellent Black Sheep Brewery restaurant. 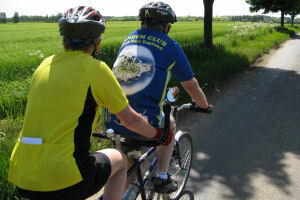 A large group of Tandem Club members enjoyed a guided tour of this small traditional brewery. 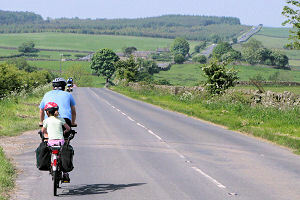 From Masham it was, of course, down and up many more hills back to the campsite to complete 23 miles. Oh no, not rain as well as wind! At least it was the official "off day" so people could legitimately take to their cars to explore a little further afield. 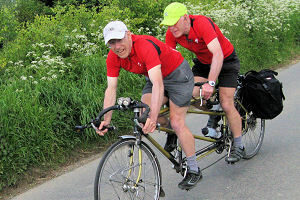 By early evening the rain had stopped, the sun had come out and the wind had died down and one tandem team joined in the local Harrogate Nova Cycle Club's weekly 10 mile Time Trial. 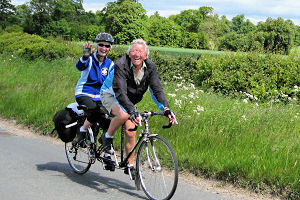 A mixed day of sun, cloud and wind and we were off amongst the, now familiar, hills to Ripon, after which we turned north and went along some very pleasant flattish lanes through Wath and Carthorpe. 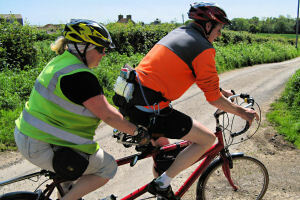 The going became harder against the west wind as we made our way to Bedale for coffee. After the break at Bedale, we made a south west loop to bring us to the beautiful privately owned Thorp Perrow Arboretum. 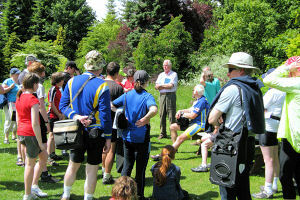 The owner, Sir John Ropner Bt., led us on a very informative guided walk through the arboretum before turning us loose to do our own exploring in the café, falconry centre and children's play area. 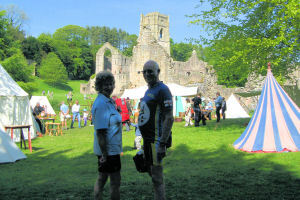 38 miles later we arrived back at base via Well - uphill, down into West Tanfield and the various hills of Kirkby Malzeard. 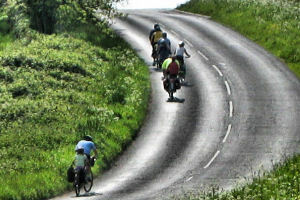 It was a sunny and hot day for potentially the longest ride of the week. 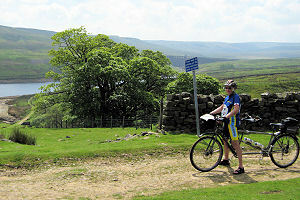 We cheated and took vehicles to Wath (a different Wath to Thursday's ride), from where we were able to enjoy a lovely ride along the west side of Gouthwaite Reservoir to Lofthouse and then take the quiet and gently climbing waterworks road to Scar House Reservoir. 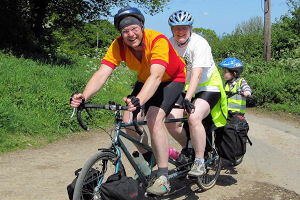 There's a nicely tarmacced road along the south side and over the dam wall at Angram Reservoir but we wouldn't recommend your making the circuit of Scar House Reservoir as the permissive bridleway is very rough and puddly and rather hard going on a tandem. 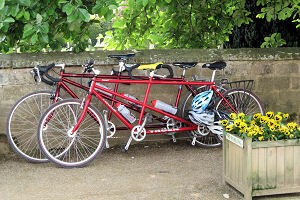 We drove into Pateley Bridge, had tea and cakes outside a very pleasant cafe and saw a couple of tandem teams in the town - had they ridden all the way? If so we were full of admiration as the access in and out of Pateley Bridge was truly terrifying with horribly steep gradients and nasty gullies across the roads. 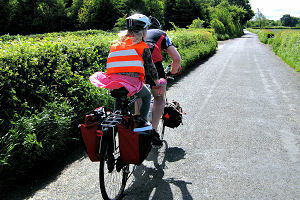 In fact it was a local cyclist who had warned us of these gullies and suggested that we do a car-assist ride. 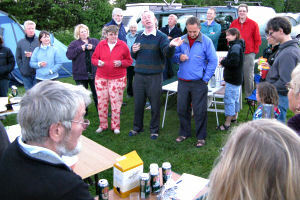 The rally was rounded off with a little evening gathering on the campsite. Saturday was still sunny and hot and ideal for drying out tents prior to packing away. Goodbyes and thanks were made before we all went on our separate ways to end a very enjoyable "casually organised" National Rally. Many thanks to Neil, and everyone else concerned, for pulling this one out of the bag. Another scorching day saw us at the BikeRadarLive cycle event at Donington Park Racing Circuit. 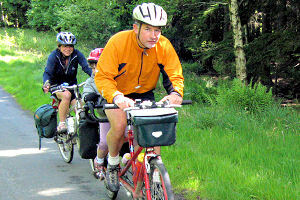 JDCycles had issued a discounted invitation to Tandem Club members to join them there. 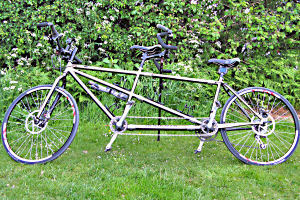 They'd brought their whole tandem stock (30) for people to try out. 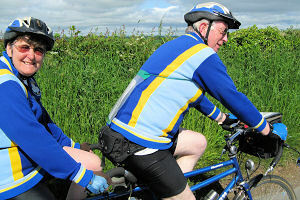 And people were certainly taking them up on their invitation to try out tandems as we saw many couples on tandems both doing laps around the racing circuit and trying out a little more gently on the grass exhibition field. Ruth & John said they'd had a huge amount of interest over the weekend. 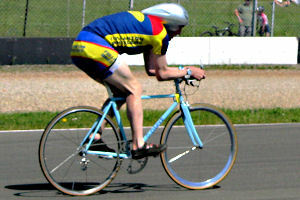 There were all sorts of other things going on: Hot Laps (Graeme Obree did one or two), Devil Take the Hindmost race (Stephen Roche took part), interviews with Graeme Obree and Stephen Roche, dual slalom races, dirt jumping, a mountain bike course on which bikes could be taken to try out, trials bikes tricks, there'd been a 12 hour endurance race over Saturday night and floodlit dual slalom racing. Definitely worth stopping off for on our way home.